Brendan O’Callaghan is an associate in the Intellectual Property group in Axinn’s Washington, DC office. He received his law degree, with honors, from The George Washington University Law School, where he was a Research Assistant to esteemed IP guru Professor Roger Schechter and interned for a multinational data storage and management company in Sunnyvale, California. 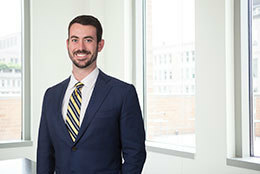 Prior to joining Axinn, Brendan was a patent litigation associate at another firm in DC and clerked for the Honorable Mary Ellen Coster Williams at the Court of Federal Claims. Brendan served as a Surface Warfare Officer in the United States Navy before attending law school. He graduated from the United States Naval Academy in 2010 with a degree in Aerospace Engineering. *****Not yet admitted to practice in Washington, DC.